Posted by Kassouni Law at April 18, 2016 & filed under Constitutional Property Rights. It’s not often that a property rights plaintiff will tell a Texas federal district judge to follow Ninth Circuit precedent on a property rights issue versus the federal government. Yet that is precisely the circumstance that several landowners face in litigation involving the federal seizure of approximately 90,000 acres of private property along the Red River in Texas. The dispute has its origins in the Louisiana Purchase, when the United States acquired a large portion of its current holdings from Spain. Under the terms of that treaty, the United States acquired all lands North of the South Bank of the Red River, and Spain retained all property to the south of that line. When Texas won its independence from Mexico, it became the successor in interest to Spain under the Louisiana Purchase. 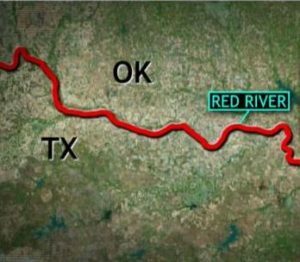 Oklahoma entered the union several decades later reducing US holdings in the area to nothing more than the sandy bed of the Red River. For more than a century, the states of Texas and Oklahoma have issued deeds and collected property taxes on all the property running up to the banks of the river. That year BLM agents hammered stakes into the ground on private property along the Red River in Texas where BLM claims the south bank of the Red River is located. In some places, these markers are more than 2 miles South of the running water of the Red River. In doing so, the government effectively claimed approximately 90,000 acres of private homes, farms, and ranches that had been in families for generations. And it did so without paying a dime and compensation. Some of those ranchers filed suit in federal court in a case titled Aderholt v. United States Bureau of Land Management. So what does this have to do with the Ninth Circuit? As a result of various historical circumstances, the vast majority of federally owned land is in the west. For example, approximately 80% of the state of Nevada is federal land. 45% of California is federally owned. Texas, by contrast, has virtually no federal property within its borders (approximately 1% is federally owned). As a result, there’s very little Fifth Circuit case law dealing with claims against the BLM. Most of that litigation has taken place in the Ninth and Tenth Circuits (which have jurisdiction over the western states). As it stands, there’s a disagreement between those circuits as to when a plaintiff can bring suit against the federal government to dispute a federal claim to his property. The Ninth Circuit holds that once the federal government takes action that places a cloud on an individual’s title, that person has a right to file suit and have the court sort it out. The Tenth Circuit, by contrast, recently held that a cloud on title alone is not sufficient to bring suit. Just this year, the United States Supreme Court refused to hear a petition from the Tenth Circuit asking the Court clear up this confusion. Which brings us back to the case in Texas. Of the numerous property owners who sued the federal government, several own land that the federal government has not surveyed. Instead, BLM simply published maps claiming to own it. The government claims that these maps merely clouded title, and therefore are not sufficient for those property owners to bring suit. All this leaves those Texas property owners in the unique position of asking the Fifth Circuit to follow the Ninth in order to aggravate a circuit split, and eventually, encourage the Supreme Court to take up the case. At the end of the day, it is outrageous that the federal government can make a claim to private property and that the owner would not be allowed to seek redress in court. It is high time the Supreme Court rectified this issue. But to get there, a Texas District Court with a conservative judge has to lead by following an opinion from the Ninth Circuit.